Gordon Hayward update: the cast is off...kind of. Gordon Hayward's wife, Robyn, posted an Instagram video of her hubby playing video games with their eldest daughter on his lap. It was just a typical video of at-home-life for the Haywards, and was meant to spotlight their daughter more than anything. Gordon playing video games is also normal, as he's been known to twiddle the joysticks in his spare time. Ho hum. Nothing to see here. There is no cast on his left leg! Of course, this caused a manic episode for the internet. Everyone went crazy, and began to speculate what it could mean. But then the all-telling Brad Stevens stepped in and cleared up any uncertainty. Robyn Hayward had an IG story video of a boot-less Gordon Hayward. Brad Stevens reminds everyone that he doesn’t wear it 24-7. Gordon still wears a boot most of the time, but he can take it off when he's lounging at home. That's that. When he's mobile, the boot is on to keep his leg intact. 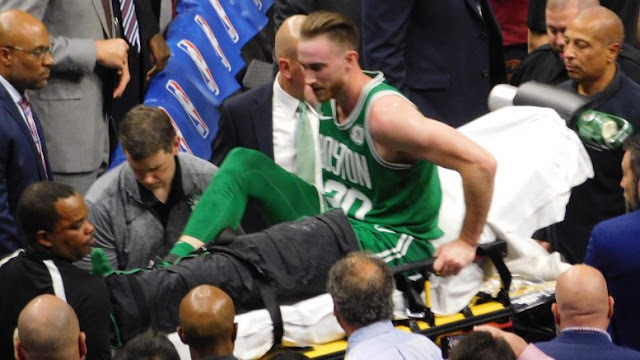 There haven't been any updates on Hayward's return, and he's still expected to miss the entire season because of the injury that occurred on opening night. Nevertheless, it's exciting to see him progress. Sooner or later, he'll step out of the chair and begin to take regular, standing jump shots. God speed, Gordon.